Regal and finished in antique gold, this set of Quinn Horse Bookends will add class to a home office or living room bookshelf. 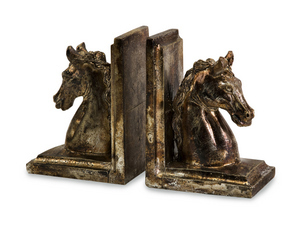 Whether placed together or staggered on separate shelves, the bookends will stylishly complement your collection of books. For a coordinated look purchase matching statues.